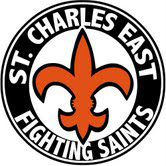 HOME OF THE "Fighting Saints"
I 88 West to Kirk Road, Kird Road North to the high school. Varsity and lower level fields are located on the east side of the school. The stadium is located on the east side of the building. Enter from Dunham Road. campus on the Dunham Field located south of the building or Fedtke Field located north of the building. are located North of the building. SWIMMING AND DIVING â€“ Norris Recreation Center. 1040 Dunham Road- attached to the high school bldg. The sports complex is located behind Norris Stadium and the Tennis Courts. Some lower level games/matches are played in this building.